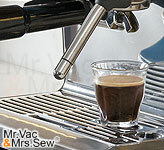 The Breville Barista Touch is an espresso lover's dream, allowing for great tasting espresso in less than a minute. The Barista Touch grinds beans with ease while boasting a 3 second heat up time for the freshest espresso possible and comes complete with an automatic steam wand to transform milk into a silky smooth micro-foam, perfect for latte art. Featuring simple touchscreen controls and 8 customizable pre-sets, the Barista Touch provides everything you need to easily make café quality espresso straight from your home. The Barista Touch features an intuitive touchscreen display that simplifies the coffee making process. 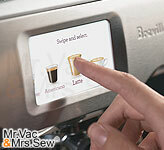 Simply follow the touchscreen's directions as it takes you through the process to make espresso step by step. 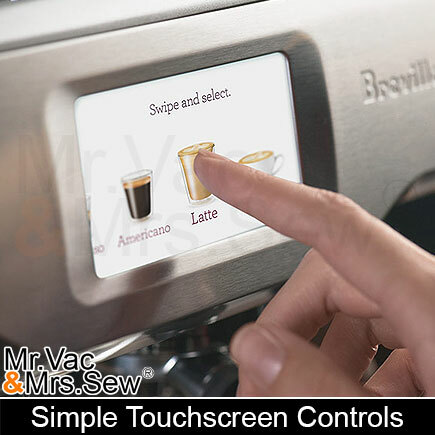 Easily adjust coffee strength, milk texture and temperature all easily through the touchscreen. 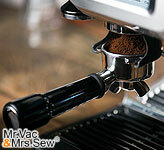 Found the right settings for the perfect cup of coffee? Turn them into a pre-set with the Barista Touch. The Touch has the availability to store up to 8 fully customizable pre-sets that are more personal than ever before. 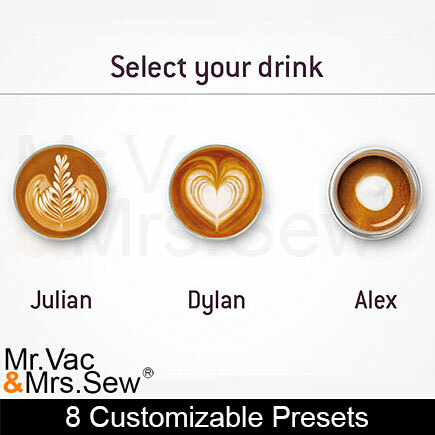 Adjust coffee strength, milk texture and temperature and save your settings using your own name and unique image. When it comes to premium café quality coffee, freshness is everything. Within just minutes of being ground, coffee beans begin to lose their flavor. 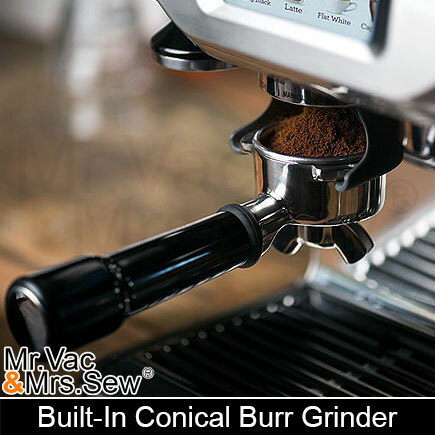 With the Barista Touch, beans are freshly ground in a matter of seconds thanks to the built-in grinder. Go from beans to espresso in under a minute with the Barista Touch. There's a reason why home-made coffee almost never tastes as good as café coffee. 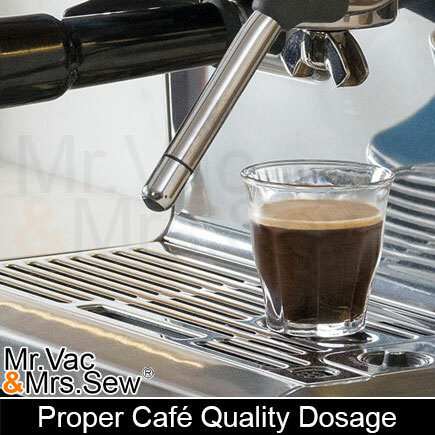 Most other coffee makers only use a dosage of 11-13 grams of ground coffee which is not enough to deliver that rich taste only professional coffee can provide. 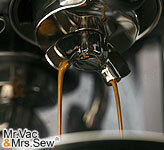 The Barista Touch uses 19-22 grams of coffee for perfect professional flavor. Time is valuable and Breville makes sure to waste none. The Barista Touch uses an advanced ThermoJet™ heating system that heats up in an impressive 3 seconds so you can get your espresso the minute you want it. 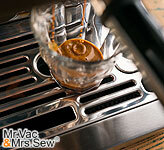 Breville knows that when it comes to espresso, a constant precise temperature is everything. A change of even 1°C is enough to throw off the taste of good espresso which is why the Barista Touch has Precise PID Temperature Control. 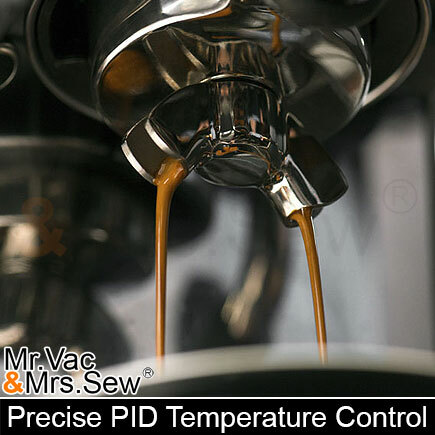 This technology detects and minimizes any temperature fluctations that may occur to keep your espresso consistently flavorful. 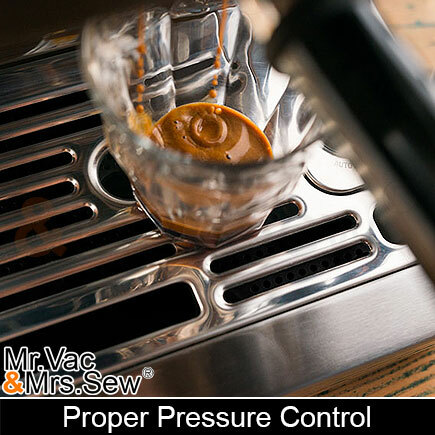 Professional espresso also requires proper pressure control, something the Barista Touch handles with ease. Using low pressure pre-infusion and 9 bar extraction pressure, the Barista Touch ensures that your ground coffee is evenly soaked for professional flavor. 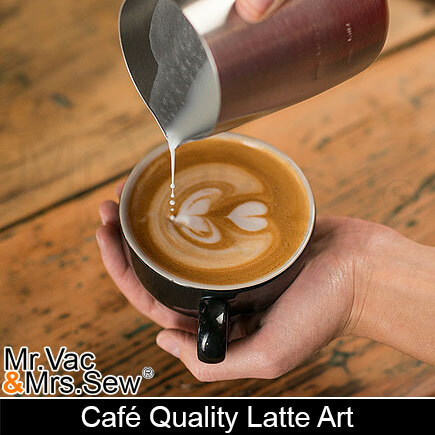 The Barista Touch has a built-in automatic steam wand allowing you to texture your milk for micro-foam milk, perfect for cappuccinos and lattes while allowing for the creation of latte art. 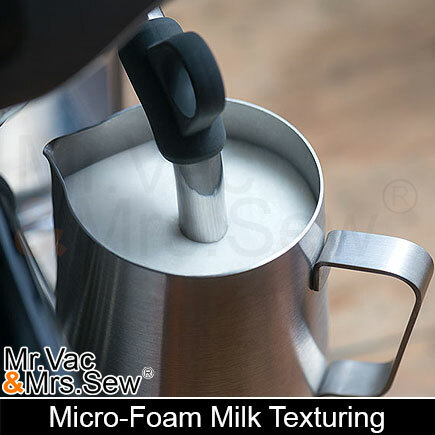 The steam wand operates easier than ever before, precisely texturing milk on its own to the temperature and texture that you specify. 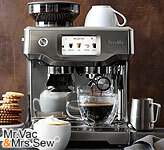 Great tasting coffee alone isn't enough to qualify as café quality and Breville knows this. Café coffee isn't complete without latte art. 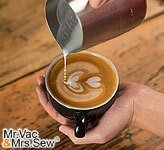 Simply texture your milk with the steam wand and create away. 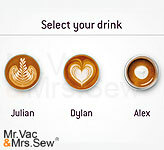 With the Barista Touch you can create latte art like a professional. 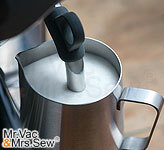 The Breville Barista Touch is made to last. Housed in an attractive yet durable stainless steel shell, the Barista Touch is the perfect addition to any kitchen. 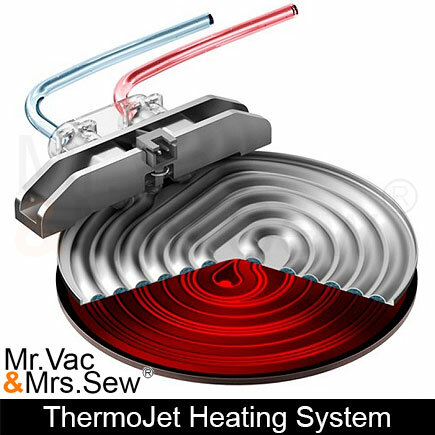 The Barista Touch comes with an Automatic Purge feature that automatically cleans the hard to reach inside of the steam wand after use to keep any remaing milk residue out and purge out any water that is at the improper temperature for the next use. Located on top of the Barista Touch is the built-in cup warmer to preheat your cup before you drink from it, ensuring that every bit of the coffee experience is absolutely perfect. 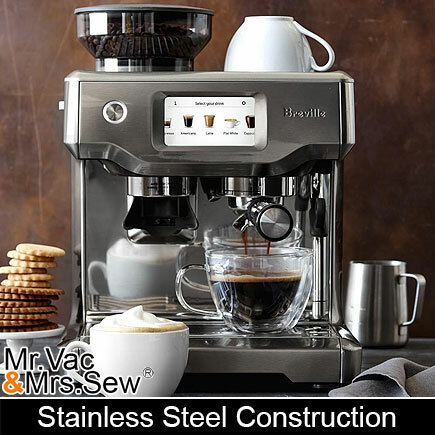 The warranty of the Breville BES880BSS Barista Touch is a 2 Year Manufacturer's Limited Warranty. 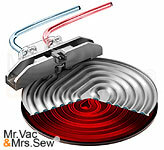 Mr Vac & Mrs Sew is an authorized Breville dealer. W 14.5" X H 16.7" X D 17.6"